Airfield on loan form R.A.A.F. Start of February 1945 - No.1 Special Maintenance party arrived on site. 27 March 1945 at Archerfield. The airfield lies 3½ miles SSW. of South Brisbane and about 1 mile W. of the Brisbane - Sydney railway. Oxley Creek flows fro, 500 to 800 yds. past the SW. side if the airfield, and loops of the Brisbane river lie about 2½ miles to the N ad NW. Access to the main road to Brisbane; Brisbane Central railway station on the W. bank of the Brisbane river, is distant 8 miles (R). Station on the railway to South Brisbane is distant 1½ miles (R) NNE. Control Building on the E. side of the landing area. The airfield is in use by R.A.A.F., D.C.A., and U.S.A.A.F. Irregular shape with natural grass surface. Unsafe fir heavy aircraft when the field is wet, but otherwise suitable foer all types at all times. 00/18 - N/S ........1870 yds. 04/22 - NE/SW ....2230 yds. 10/28 - E/W .......2000 yds. Hills rising 600' above e he airfield 3¼ miles NNE. and NW. Control building, 100' on the E. side if the landing area and trees, 30' adjacent NE. W/T masts, 200' about 1¼ miles NNE. T.A.M.Y. Living quarters are at Rocklea Camp about 1mile N of he airfield. T.A.M.Y. 1 mans aircraft workshops at and near the airfield. Facilities at the airfield for major engine overhauls and essential aircraft repairs. Equipped with 3 x Sea Otter. Formed at Archerfield 01.06.45. Moved to RNAS Maryborough 23/06.45. Equipped with 24 Corsair IV. A civilian airport on the outskirts of Brisbane was partly taken over by the Royal Australian Air Force (RAAF) n September 1939 when they took over the Royal Queensland Aero Club facilities at Archerfield Airport. R.A.A.F Station Archerfield established itself by building its own hangars and huts along the southern boundary of the field. Archerfield was to become an important military facility for the R.A.A.F, but on July 1st 1942, the R.A.A.F transferred control of the airfield to the United States Army Air Forces; An igloo complex of five hangers at Kerry Road was used for military aircraft maintenance and repair by the US 81st Air Depot Group, occupying the centre two hangers, together with the civil operators QANTAS and ANA occupying the two outer hangers. The fifth was used for storage. 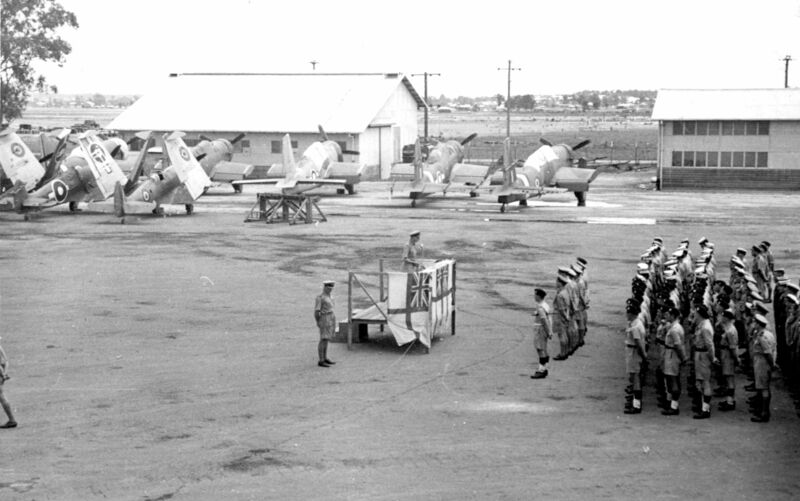 At the start of 1945 several sites in Australia were earmarked for use by the Admiralty to establish rear echelon support facilities for the Fleet Air Arm for upcoming operations in the Pacific theatre; Archerfield was selected to house the first Transportable Aircraft Maintenance Yard (TAMY 1). The unit inherited facilities formerly used by US forces in the Brisbane area, the US presence having been withdrawn after the liberation of the Philippines; the principle facilities left by the Americans were those at Kerry Road and Rocklea Camp. An advance party of TAMY I comprising of 4 officers and 28 technical ratings had been sent out from UK on earlier transport, arriving in Brisbane at the beginning of February 1945. This party, together with 80 hands loaned from HMS GOLDEN HIND, the RN Barracks in Sydney and supplemented by the addition of No.1 S.M.P. (Special Maintenance party?) were accommodated at Rocklea Camp in Brisbane, this camp was to be the main accommodation site for TAMY I. Known as the 'Corsair technical party' this advance party was tasked with erecting 16 Corsair IV aircraft at Kerry Road, Archerfield; 12 of the aircraft were almost completed by the time the main body of TAMY I arrived on March 27th. This was an extremely slow rate of progress; however, the work was started without any equipment or stores, all of which had to be acquired or borrowed from the Department of Aircraft Production, the Royal Australian Air Force and other local sources. Work was farther hampered in early March when many of the ratings had to be taken off aircraft erection duties in order to prepare Rocklea Camp, in advance of the main party's arrival at the end of the month. Transportable Aircraft Maintenance Yard No. 1 (TAMY 1) assembled in the UK at RNAS Ludham, Norfolk, and at RNATE Risley in Lancashire from December 4th 1944; TAMY I was commissioned as an independent command bearing the ships name H.M.S. NABSFORD, on February 1st 1945, Commander B.J.L. ROGERS-TILLSTONE in command. TAMY I departed by road and rail for Gladstone docks, Liverpool, on February 16th for passage to Australia. The main party of TAMY I, (a total of 23 officers & 1,191 ratings), sailed for Australia on board the S.S. STIRLING CASTLE on February 18th. A second, retard party, comprising of 8 Officers and 91 ratings sailed on March 10th on the S.S. EMPRESS of SCOTLAND. The S.S. STIRLING CASTLE arrived at Brisbane, on March 27th, after unloading the first echelon of TAMY I personnel TAMY I was transported to Archerfield airport the same day where it was commissioned as HMS NABSFORD, Royal Naval Aircraft Maintenance Yard Archerfield. 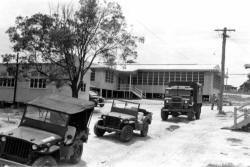 Rocklea Camp was the administration and accommodation base of TAMY 1, aircraft operations were conducted at Archerfield airport and Kerry Road. 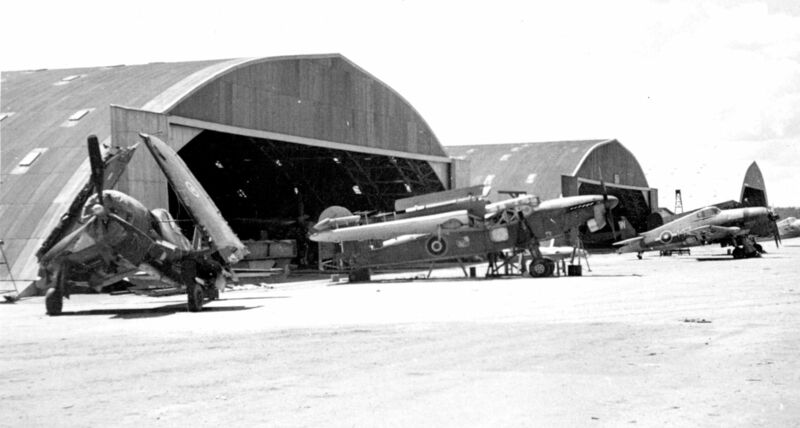 The Air Yard' eventually occupied several sites in the city, not all were close to the airfield: Airfield facilities were at Archerfield; aircraft erection, inspection & repair, air radio and air gunnery workshops were at Kerry Road, Archerfield; engine & ancillary workshops at Rocklea Factory; Workshops for the reduction of airframes to spares and produce at Benedict Stone Works; airframe parts and engine store at Runcorn; accommodation at Rocklea Camp. One of the main problems facing TAMY I was transport; owing to the dispersed nature of the ‘Yard’ large numbers of personnel needed to be ferried to and from their accommodation to their places of work. Aircraft erection, airframe inspection and repair, air radio and a part of the air gunnery workshops were situated at Kerry Road, Archerfield airport, about 2 ½ miles from Rocklea Camp and 3 miles from Rocklea Factory. Later site acquisitions like Benedict Stone Works were 5 miles away across the city. It was clear that arrangements for flying would be limited, Archerfield was a busy civil and military aerodrome; flights were restricted to maintenance test flying, routine storage flights and aircraft ferrying. Initially, TAMY I set up its own flying control alongside that of the civil control in Archerfield control tower but this system was abandoned as the volume of naval flying grew. Civil control of all flying was adopted and a naval flying control officer acted as liaison. By far the greatest difficulty encountered by the TAMY upon its arrival in Australia was the complete absence of ground equipment and air stores. Much of this was to be issued from local stores; the rest was still en route from the UK on the slower transport ships. Work commenced using borrowed stores and equipment, loaned from the Department of Aircraft Production, Royal Australian Air Force and American sources, together with some local manufacture of parts. The spares shortage was so severe that engine overhauls could not be undertaken for several months, parts requiring complete replacement on overhaul simply did not exist in Australia at that time. Another problem was the carrying out of essential constructional work; the partitioning and fitting up of workshops and offices and large items such as the building of stop butts, without which no air gunnery testing could be carried out. All of these works were scheduled to be carried by the Allied Works Council, but their work programme was so far behind schedule it would be months before anything would be started, therefore manpower and resources from the unit were utilised to put these projects in hand. An air to sea firing range was also established in Moreton Bay. The original monthly output for which TAMY I was complemented called for 15 major inspections, 25 minor inspections (and modifications), 25 aircraft erections, and 25 engine overhauls; the need to divert manpower to construction works coupled with equipment and spares shortages resulted in only 4 Corsairs being erected by the Ait Yard, 3 Expediters were erected by a civil firm at Archerfield with assistance from ratings from the Yard. From June, the reduction to spares and produce of category Z (beyond repair) aircraft sent back from the forward area was added to the Yard's tasking. to facilitate this new function additional premises were acquired at the Benedict Stone Works, about 7 miles from Rocklea Camp, and fairly convenient for access to the wharves. To help ease the work load at Archerfield a party of three Petty Officers and twenty-one other Ranks was sent to R.A.A.F. Oakey to begin assembling crated Seafires, striving on the station on May 18th. However similar problems as at Archerfield meant that he first completed Seafire III (PR196) was not ready for dispatch to Archerfield until July 14th. This was followed by a farther eight aircraft on July 30th. On June 1st 1845 Naval Air Squadron was reformed at Archerfield as a single seat fighter squadron, equipped with 24 Corsair IVs. The squadron was to move to the newly established MONAB 6 at Maryborough on the 23rd. June’s programme called for 10 Seafire III & 40 Corsair IVs to be erected together with 5 Corsair II & 1 Corsair II TR for minor inspections. Performance figures were 0 Seafire III, 24 Corsair IVs erected, 5 Corsair II & 1 Corsair II TR inspected. No Seafires could be assembled due to there being none available for erection until late in the month. The Corsair IV figures were affected by 11 engine changes becoming necessary through sand-contamination, and also by lack of electrical spares. The minor inspections required more work than normal, the Corsair II aircraft having suffered considerable corrosion before arriving at Archerfield. Early June saw the completion of the stop butts at Archerfield undertaken by Yard resources. Later in the month three large stores were acquired at Runcorn, about 6 miles from Rocklea Camp and 4 from Kerry Road. These were to provide an airframe parts store, an engine store and a general store; this acquisition resulted in the building of a 20,000 sq. foot store at Kerry Road being cancelled. At the beginning of July Commander Rogers-Tillstone was promoted to the rank of Captain on the 1st, and the Flag Officer Naval Air Pacific (F.O.N.A.P. ), Rear Admiral Portal, visited the station on the 8th; Admiral’s Divisions were held, and the Admiral addressed the ships’ company, praising their efforts and predicting that TAMY I could expect to be on station for at least another year. Early July also saw the conversion of a building at Archerfield, acquired from the R.A.A.F., into a Test Flight Office, and a Maintenance Test Flight was set up as a separate entity under the Senior Test pilot. The ground crew consisted of ratings who had by now gained valuable experience of test flying snags. In July an attempt was made to recover the shortfall in Seafire production. Targets were; erections - all available Seafire III - up to 25. & 25 Corsair IV, perform minor inspections on 15 Corsair II. Performance was only 9 Seafire III & 25 Corsair IV erected with 11 Corsair II inspections, 1 Engine change and 1 Avenger (major Inspection). A further hold-up in the Seafire erection line occurred when a batch of crated airframes were received with unmatched mainplanes. Uncompleted Corsairs resulted from stores being unobtainable. From August 10th the site at Archerfield was shared by MONAB VII, HMS NABREEKIE; this unit was outfitted as a Forward area Receipt. This unit had arrived in Australia on July 28th and it was decided to operate it alongside TAMY 1 at Archerfield until being called to the forward area. Camp Meeandah, near to the Eagles Farm airfield in Brisbane was to be taken over by MONAB VII which commissioned as HMS NABREEKIE at R.N. 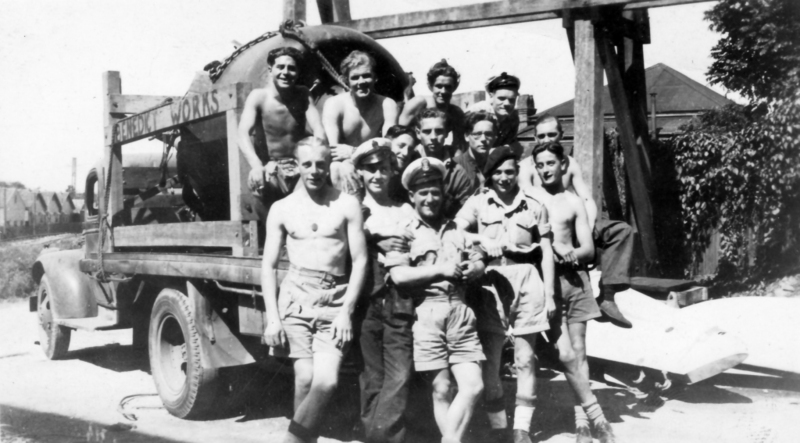 Camp Rocklea as on August 8th 1945 and work commenced two days later when 300 ratings began work at Kerry Road,; this resulted in some disruption while they were introduced to the stage system in use for aircraft erection. These additional ratings were integrated into the TAMY I gangs, and in some areas took over from them. The small RN detachment at R.A.A.F. Oakey was supplemented by the addition of 50 ratings and NCOs from MONAB 7 from the beginning of August. Victory over Japan (VJ) Day was announced on August the 15th and this was celebrated in Brisbane the following day. August also saw the introduction of the new Seafire Mk. XV to THE inventory; August’s programme called for 20 Seafire III, 5 Seafire XV, & 40 Corsair IV to be erected, with 10 Corsair II & 5 Corsair II (T) for minor inspections. 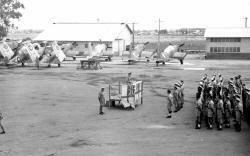 Performance figures were 9 Seafire III, 0 Seafire XV, 23 Corsair IVs erected, with I Corsair II & 1 Seafire inspected. Delays in Seafire production continued as in previous months, and Corsair output again suffered due to all Corsair IVs being required to be fitted with Gyro Grin Sights. Work on engines was able to commence during September; none being possible during April to August apart from putting one or two engines through to test the lines and to practice the personnel concerned. Limited supplies of some outstanding spares became available in September enabling a few engines to be processed during the month. With the war against Japan now over, the numbers of replacement aircraft required for the British Pacific Fleet had reduced considerably, work shifted towards the stripping out of surplus aircraft and disposal of surplus airframes, engines and other equipment. On October 15th the personnel and aircraft of 721 Naval Air Squadron disembarked from HMS UNICORN, having been evacuated from RNAS Ponam (MONAB IV) in the Admiralty Islands. The squadron, a Fleet Requirements Unit, was at Archerfield to re-equip before sailing to Hong Kong for operations with MONAB VIII at Kai Tak airport. The new equipment complement was 12 Vengeance Target Tugs, 6 Defiant Target Tugs, 9 Corsairs, 2 Avengers, and 1 Harvard. The squadron was to remain at Archerfield for the next two months preparing and testing their new aircraft. Rear Admiral Portal flew into HMS NABSFORD on October 22nd and addressed the assembled ships’ companies’ at Kerry Road; he told the men that TAMY I would be scaling down over the next few months but still had an important role to play, announcing that the newly arrived MONAB VII would be paying off in early November to leave a much smaller ‘Air Yard’ to continue the repair and maintenance tasks which still existed. The personnel of the RN detachment left RAAF Oakey to return to Brisbane on October 26th having completed and dispatched total of 29 Seafires. A week later the first 500 men from HMS NABSFORD were embarked on the S.S. STRATHENDEN for passage home to the UK. On November 1st the three Sea Otters of 1701 Squadron ‘A’ flight arrived from RNAS Maryborough to prepare for embarkation in HMS STRIKER on the 4th, this unit was also bound for MONAB VIII at Kai Tak airport. HMS NABREEKIE & MONAB VII was paid off on November 5th 1945. 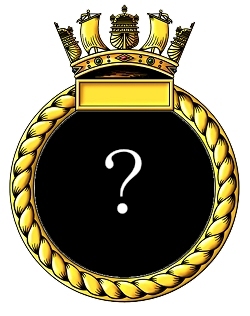 In many ways the paying off of HMS NABREEKIE appears to have been a paperwork exercise; the personnel of MONAB VII who were not drafted back to the UK (this appears to be the majority of the non-commissioned personnel) were transferred to the books of HMS NABSFORD, fuming Mobile Repair unit No.3 (MR3) and work continued as usual. 721 squadron embarked in HMS SPEAKER on December 28th, this was to be the last Fleet Air Arm flying unit to operate from Archerfield. By mid-February the ships’ complement had been reduced by two thirds, approximately 1000 men being drafted either home or to RN Barracks , Sydney. HMS NABSFORD & RN Air Maintenance Yard Archerfield paid off March 31st 1946 and the ‘Air Yard’ closed, one year and four days after the main body of TAMY I arrived at Archerfield. The R.A.A.F was to maintain a presence on the airfield until September 1955; 23 (City of Brisbane) Squadron reformed at Archerfield in 1947 with Mustangs, converting to Vampire jets in 1955. The grass fires started by the Vampires' jet exhausts on the all grass landing area necessitated the squadrons move to R.A.A.F Amberly in September of that year. Nearby Eagle Farm was to be re-established as Brisbane's principal airport with operations commencing in 1949, Archerfield becoming Brisbane's secondary airport, and a thriving light aircraft centre. Today, Archerfield is still Brisbane's second airport catering for general aviation needs; occupying over 600 acres, it has two permanent runways, one of which is lit for night flying, and two grass runways. It is home to the Department of Emergency Services rescue helicopter flight, the Air Training Corps, the Queensland Flying Museum and, the Royal Queensland Aero Club, who still occupy their original hangar. The Igloo hangar complex at Kerry Road still survives today but not as part of the airport, having been sold in the early 1950s, and were used by companies specialising in big earth-moving plant, Thiess Brothers and Hastings Deering. The complex is a protected site of architectural significance. Drury, A.J., (2000 - 2014) 'The MONAB Story' - A history of the Mobile naval Air Bases of the Royal Navy. 6676/45 Mobile Naval Air Base Np.VII (H.M.S. "Nabreekie") - Paying Off. 3099/46 Transportable Aircraft Maintenance Yard No.1 (H.M.S. "Nabsford") Paying Off. Monday, 22nd October, 1945, Rear-Admiral R. H. Portal, D.S.C., R.N., Flag Officer Naval Air Pacific, addressing the assembled Officers and Ship's Company. On this occasion he outlined the future programme for T.A.M.Y.1 during the ensuing months. Seafires and Vultee Vengeance planes are lined up in the background. Photo: From the collection of L.J. Jay editor, Nabsford News magazine. The Factory Site in Compo Road. 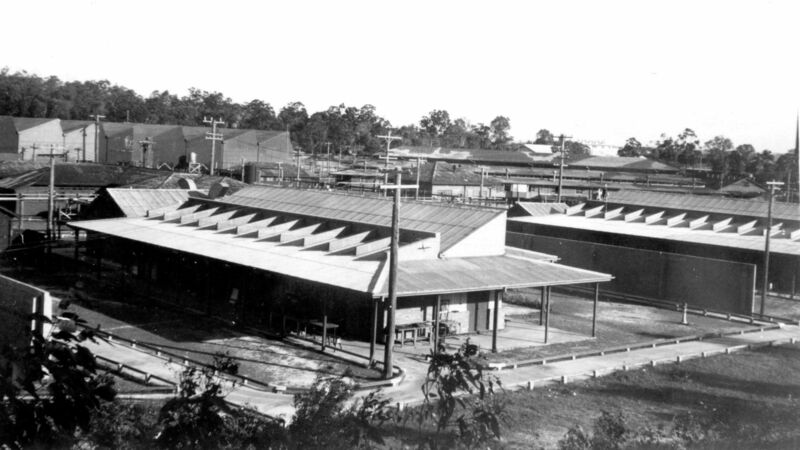 In the foreground are the Carburettor, and Instrument Shops, while on the left, backed by trees, rises the serrated roof of the Engine Repair Shop. Photo : From the collection of L.J. Jay editor, Nabsford News magazine. Some of the men working at the Benedict Stone Works reducing airframes beyond repair to spares and produce. Photo: From the collection of Leonard Buxton former Air Fitter (L) TAMY 1.